At last, change is moving to the White House. It is a wonderful day, isn't it? What an interesting illustration. 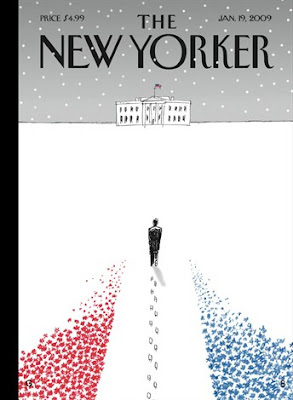 There aren't any footprints exiting the White House; and he's walking toward it alone. Barack Obama is not alone. even though he's alone in that picture, we are all right there beside him. i wonder if the slaves who built that house dreamed that one day a man of color would be living inside it as President? omg I love that cover. I am still teared up over the moment. I heard Spike Lee's wife say yesterday that she felt the ghosts of all the people who came before her with her. I imagine Obama does, too. I wonder how it feels to be a man & a symbol at the same time. Heavy burden. I know if anyone can handle it respectfully, it's him. Hope, baby. It's a fine thing to feel after so long. And excited about our new world order. The future is looking up.